The Loyola University Chicago has long been known for advocating greater understanding of the history of World War II and has led initiatives promoting Jan Karski, including the Jan Karski 2014 International Conference on Memory and Responsibility, organized in cooperation with the Jan Karski Educational Foundation. 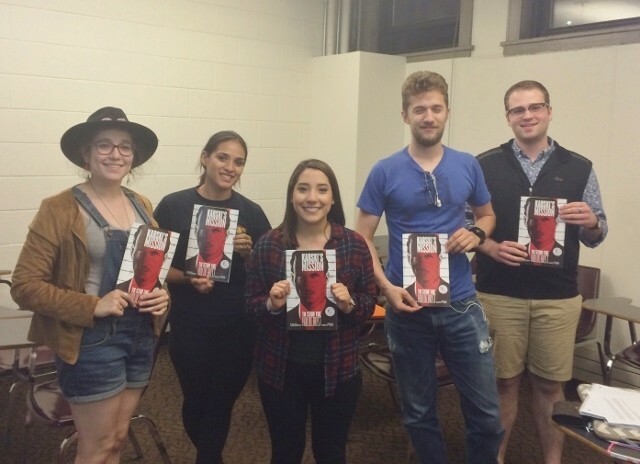 Recently, Dr. John Merchant, Lecturer in Polish, Irish, and Polish American Literature at Loyola University, has introduced the graphic novel Karski’s Mission: To Stop the Holocaust to his students taking LITR 200 European Masterpieces: Literature in Film (WWII) class at LUC. Here are the comments written by the students after reading the book. “Jan Karski, born Jan Kozielewski, started his fight for Poland as an army officer. A month after his capture, he makes a daring escape and makes his way back home. He discovers the atrocities the Nazi Germans are committing on the Jewish population in Poland, and joins the Polish underground in an effort to warn Western leaders of the Holocaust in an effort to end it. Through a series of clever disguises and committed networking, Karski finds himself in the Western Capitals of London and Washington D.C., only to fall upon deaf ears. Karski turns to literature to spread the word about the atrocities and becomes successful as an author and then as a professor, after the war. In the 1970’s Karski is interviewed about his wartime experiences, finally giving him closure to what he believes is his own failure of diplomacy. “Previously one that held comics in contempt, the illustrated story of Jan Karski forever transformed the way in which I approach alternative forms of literature. The Jan Karski Educational Foundation published the work with the text by Dr. Rafael Medoff and illustrations by Dean Motter. Taking a multifaceted narrative and transforming it into a few dozen pages of drawing and blurbs of text is no forgettable feat. Facing the challenge of overlooking a critical detail of Karski’s life, the book is able to brilliantly relay the story of Karski’s heroic actions aimed at exposing the Holocaust. The comic focuses on key events that lead to Karski’s entering of the ghetto and transit camp in order to reveal to Western leaders the happenings inside these respective hells and his pleas for some action to be taken. Though his words were not immediately heard and Karski is devastated with pangs of defeat, the comic helps the reader to understand Karski’s resilience, bravery, and determination even though Karski may not immediately have seen these things himself. To order the book, please contact the Jan Karski Educational Foundation at info@jankarski.net. Texts have been slightly edited for space and clarity.